You may have heard the story about Miles Davis telling Herbie Hancock not to play "the buttah" notes. But did you know that he also once told John Scofield and some of their fellow bandmates that he WANTED them to "play the buttah notes"?! Weird, right? Why would he tell Herbie not to play the 'buttah' notes and years later tell other band members to play them? And what the hell is a 'buttah' note? Let's be honest... with Miles... sometimes things were just cryptic. Maybe he said strange things to get people out of their comfort zone so they'd try something new... who knows? But let's look at how Herbie and Scofield both interpreted their experiences to see if we can learn something to put into the shed. As the story goes, Herbie was sitting at the piano, Miles walked over and said, "Don't play the buttah notes." Herbie thought Miles was saying 'butter' notes. He didn't know what those were but figured he must have meant the 3rd and the 7th, so he stopped playing those and leaned more heavily on the other notes of the scales and chords and a new dimension of modern jazz harmony flourished. 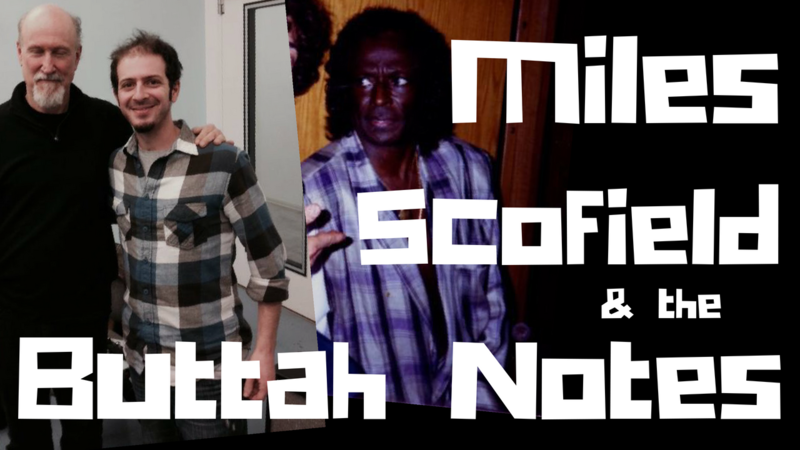 During my year hanging with Sco, he told me that when he was playing in Miles' group, Miles told him and the other band members to play "the buttah notes." Just like you and me, they had no idea what the hell a 'buttah' note was. You can imagine Scofield imitating Miles' voice saying, "Nah man... play the buttah notes... play the buttah notes!" This was before the internet, so Herbie's story hadn't yet made it into the jazz history books. Sco and the guys didn't know what buttah meant and thought it was Miles' raspy, whisper voice way of saying better. "Nah man... play the better notes." So what is a better note? I mean... we have diatonic notes vs non-diatonic. But better? The way Sco and I talked about it... it's almost like there are good notes, and then there are better notes. It's not wrong to play the good notes. It's important to know them. The chord tones and scales and the "right" stuff to play. But playing the better notes requires transcending beyond that. And to get even deeper about it... Monk's better notes were different from Ornette's and Coltrane's. And frankly, the better notes for any of these players could have been different on one tune than on another tune! There are so many variables that go into this. Of course, the tune that's being played and the player's phrasing and their sense of time and feel is a huge factor here. But for me, a lot of it boils down to the attitude and mojo of the player. Their personality and the relationship they have with the instrument and their sounds. They KNOW what they want to convey. Not simply intellectually, but in a guttural, emotional way... they put their hands on their instruments and simply feel where these better notes are. It's very personal for them. It's the way they express their humanity. Are the notes found in scales? Yeah, probably. But it's not about playing the right notes from a key... it's about expressing something. Conveying their humanness. Communicating emotion. This is one of the many things that eventually led me to become obsessed with melodic triads. Take for instance the video example below. I'm basically using a pentatonic scale made up of Eb - F - G - Bb - B to play over G7alt. Nothing controversial there, right? It's 5 of the 7 notes of the Ab melodic minor scale. But for me, the Eb triad notes are my resolution points. That allows for two interesting things to happen. First, it tonicizes the #5/b13, the root, and the #9 (meaning that these notes - 2 of which are altered upper extensions - are going to feel like the most stable resolution points within the melody). This gives a sense of strength and integrity to some very colorful sounds. Second, it turns the 3rd and the b7th of this altered dominant into melodic tension notes. Tension notes want to move. They have an emotion to them. Check out the video below and see if you can hear the emotions I'm trying to take advantage of. And we could take our practice beyond where this video leaves off. We could pick a 3rd tension note, or a 4th, or 5th. And each of them will yield a different emotion... and will give me the chance to explore how I personally connect with that sound and that emotion. It helps me find a sense of attitude about have something honest, authentic, and emotion-driven to say as much as it gives me a series of notes to play over a chord. It allows me to have a personal function and purpose behind each note. As an improviser and composer, these tension notes allow me to focus on using them for emotional meaning. They let me express a part of my humanness rather than simply falling into the trap of running through scales simply because I know they have the good notes in them. And that's one of the many things that I keep in mind when attempting to "play the buttah notes." If you'd like to learn more about this approach and dig into the harmonic and melodic applications of it, check out our Melodic Triads Study Group. What makes a note a better note to you? What makes the difference between a good note and a better note? How do you attempt to transcend scales, arpeggios, and chord tones to get to the deeper elements of improvising music? And what the hell do you think Miles was really saying? Why did he ask Herbie not to play the buttah notes, and Sco to play them? Make sure you subscribe to our blog newsletter to get updates about new posts... and don't forget to click the share button. Guitarist, composer, and educator living in NYC. Former student of John Scofield, Kurt Rosenwinkel, Peter Bernstein, Brad Shepik, Stefon Harris, and others. Adjunct instructor and international guest lecturer and educator. Want to help us continue offering free study materials, resources, and new blog posts? Consider throwing something into our Patreon-style tip jar. We use a secure 3rd party service that will not store, or give me access to, your financial information. If you setup a recurring tip, I will NOT be able to cancel or edit it for you. You can do so through Donorbox, and I am here to help if you need.